"Life is like a landscape. but can describe it only from a distance." From a distance, I love the beauty of the name "Philadelphia". But truth is, in the heart of it...we are "Philly". I'm so glad I have a Philly blog bud!!! This makes my heart so happy! Love the tree, the puffy clouds... And that skyline!! Love this! I miss that city! Will see it in Oct for sure! Would love to see you when you are in town! Like the balance between the tree and the city. Amazing picture. Thinking of 'your Philly' with today's tragic Amtrak accident. Beautiful view of the city. What a beautiful perspective on your lovely city. I love the way the black and white unifies the natural and manmade parts into the whole of the image. Simple beauty in the B&W. A great photo and what a truthful quote. Nice shot - I like it in B&W. Will be coming up that way to visit family in Ambler soon. Perhaps we'll have the opportunity to go to the city. It's been a long time. I love the composition of this photo. And, the black and white. Would be a fun place ot have a picnic! fantastic view!! I visited there once! A great trip. I think that is where I first went to a 6 Flags park -- which being Canadian we thought was pretty cool. 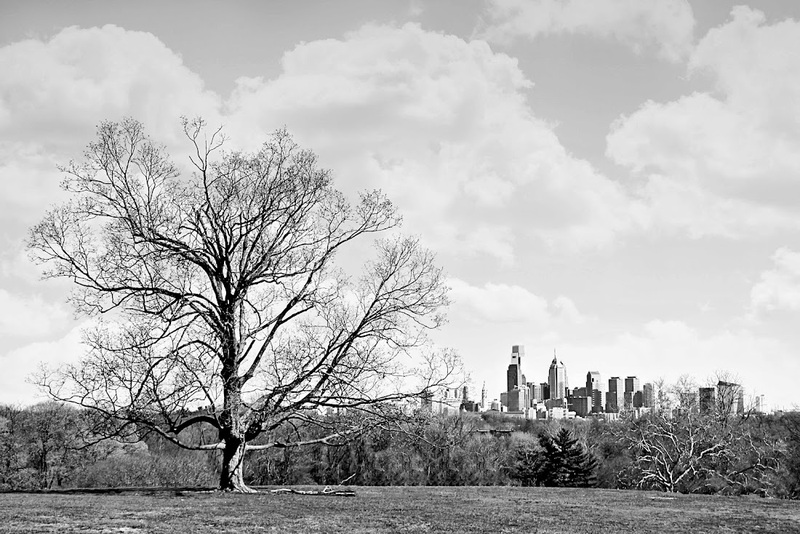 This is absolutely stunning and so perfect Philly, that imposing city centre surrounded by beautiful countryside. Great cityscape. The monochrome just adds to the beauty. Stunning capture of all that vertical movement and contrasting elements. Wow! wow- I love the composition of this shot!! Beautiful! I love the contrasting elements of this photo. How true! Trying to describe experience is distant and often hard to communicate. I love the way you captured the outside looking in perspective! Wow,- what a wonderful shot in B&W! Very nice composition. Someone can be inspired to write an amazing story from your photo. Great perspective! Great shot !